The Global Volcanism Program has no activity reports for Vulsini. The Global Volcanism Program has no Weekly Reports available for Vulsini. The Global Volcanism Program has no Bulletin Reports available for Vulsini. The Vulsini volcanic complex in central Italy covers about 2200 km2 at the northern end of the Roman magmatic province. Following lava extrusion and explosive eruptions that constructed the main Vulsini complex, the 16-km-wide, lake-filled Bolsena caldera on the east and the 8 x 11 km Latera caldera on the west were formed during major Pleistocene explosive eruptions at about 0.3 and 0.16 million years ago, respectively. 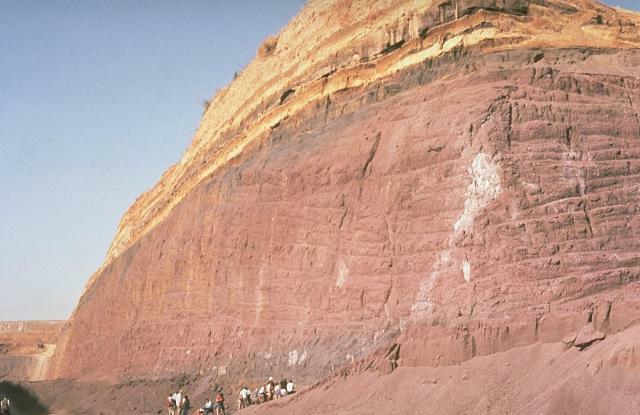 Five major Plinian fall deposits were erupted from vents at or near Latera caldera during the late Pleistocene. The latest major eruption formed unwelded pumice flows and welded airfall tuffs of the Pitigliano Formation, associated with collapse of the Vepe caldera about 166,000 years ago at the NW end of Latera caldera. Post-caldera volcanism produced scoria cones and lava flows from vents within and to the west of Latera caldera and lasted until subrecent times. Youthful-looking remnants of ash cones in Lake Bolsena may have given rise to a legend of a pre-historical fire-god, Volta. An historical report noted that "a flame shot up near Volsini" in 104 BCE. Barberi F, Innocenti F, Landi P, Rossi U, Saitta M, Santacroce R, Villa I M, 1984. The evolution of Latera caldera (Central Italy) in the light of subsurface data. Bull Volcanol, 47: 125-143. Capaccioni B, Nappi G, Renzulli A, 1994. Stratigraphy, eruptive mechanisms and depositional processes of the Pitigliano Formation (Latera volcanic complex), Vulsini District, Italy. Acta Vulc, 5: 31-39. Nappi G, Capaccioni B, Mattioli M, Mancini E, Valentini L, 1994. Plinian fall deposits from Vulsini District (Central Italy). Bull Volcanol, 56: 502-515. Palladino D M, Agosta E, 1997. Pumice fall deposits of the western Vulsini volcanoes (central Italy). J. Volcanol. Geotherm. Res., 78: 77-102. Palladino D M, Simei S, 2002. Three types of pyroclastic currents and their deposits: examples from the Vulsini Volcanoes, Italy. J. Volcanol. Geotherm. Res., 116: 97-118. Palladino D M, Simei S, 2005. Eruptive dynamics and caldera collapse during the Onano eruption, Vulsini, Italy. Bull Volcanol, 67: 423-440. Palladino D M, Valentine G A, 1995. Coarse-tail vertical and lateral grading in pyroclastic flow deposits of the Latera volcanic complex (Vulsini, central Italy): origin and implications for flow dynamics. J. Volcanol. Geotherm. Res., 69: 343-364. Sparks R S J, 1975. Stratigraphy and geology of the ignimbrites of Vulsini volcano, central Italy. Geol Rundschau, 64: 497-523. Stothers R B, Rampino M R, 1983. Volcanic eruptions in the Mediterranean before AD 630 from written and archaeological sources. J. Geophys. Res, 88: 6357-6371. Varekamp J C, 1980. The geology of the Vulsinian area, Lazio, Italy. Bull Volcanol, 43: 487-504. There is no Deformation History data available for Vulsini. There is no Emissions History data available for Vulsini. Geologists examine a quarry in a post-caldera cone of the Vulsini volcanic complex. The base of the quarry exposes thick, red-colored scoria deposits produced by strombolian eruptions that built a cinder cone. These are overlain by bedded, yellowish pyroclastic-surge deposits. Photo by Richard Waitt, 1985 (U.S. Geological Survey). 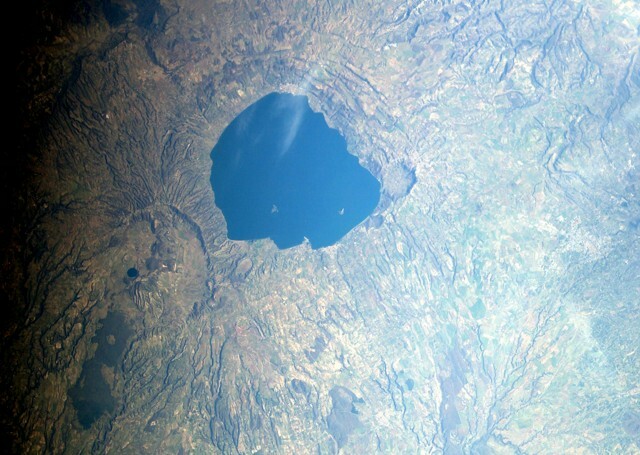 The 16-km-wide Bolsena caldera, filled by the waters of Lago di Bolsena, is the most prominent feature of the Vulsini volcanic complex NW of Rome. The 2000 sq km volcanic complex also includes the Latera caldera to the west. Both calderas were formed during the Pleistocene. 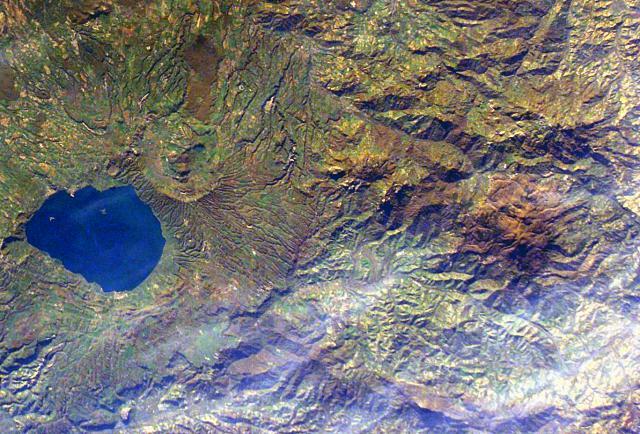 Post-caldera eruptions produced scoria cones, lava flows, and youthful-looking, ash-cone islands in Lago di Bolsena that may have given origin to legends of a fire god. The small Amiata lava-dome complex (just right of the center of this image), is located about 20 km NW of Lake Bolsena (left-center) in the southern Tuscany region of Italy. Viscous lava flows can be seen descending the flanks of the complex in this NASA Space Shuttle image (with north to the lower right). The largest of the domes is 1738-m-high Monte Amiata (La Vetta). No eruptive activity has occurred at Amiata during the Holocene, but thermal activity continues at a producing geothermal field. NASA Space Station image ISS008-E-7007, 2003 (http://eol.jsc.nasa.gov/). Three large calderas are seen in this NASA Space Shuttle image (with north to the upper left) of the Vulsini volcanic complex in central Italy. 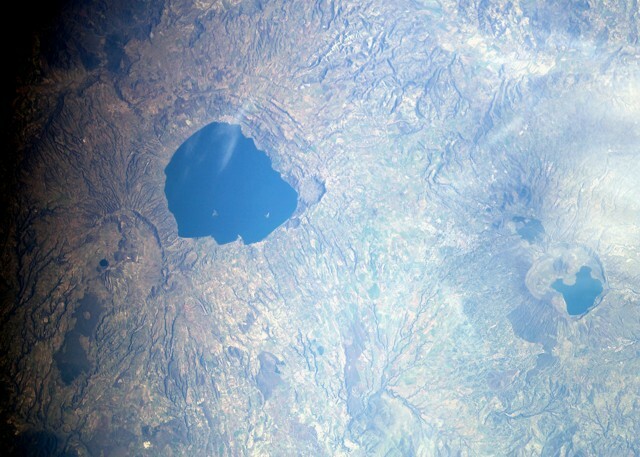 The 16-km-wide Lake Bolsena (left-center) was formed during major Pleistocene explosive eruptions at about 0.3 years ago and the 8 x 11 km wide Latera caldera (below and to the left of Bolsena) about 0.16 million years ago. Post-caldera volcanism produced scoria cones and lava flows (lower left) until subrecent times. Pleistocene Lake Vico in the Cimini Mountains lies at the right-center. NASA Space Station image ISS006-E-36701, 2003 (http://eol.jsc.nasa.gov/). Two calderas are seen in this NASA Space Shuttle image (with north to the upper left) of the Vulsini volcanic complex. The 16-km-wide Lake Bolesena (left-center) was formed following major Pleistocene explosive eruptions at about 0.3 million years ago. 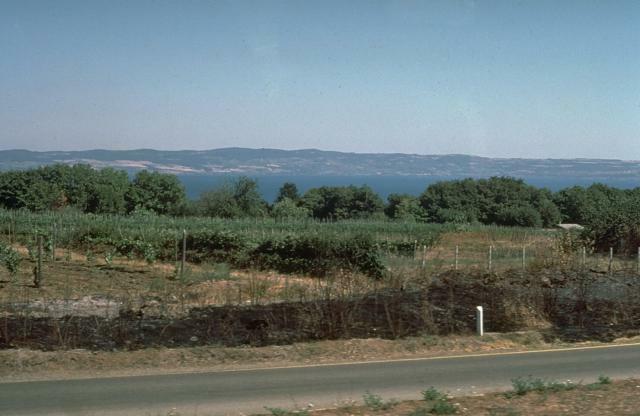 The 8 x 11 km wide Latera caldera (below and to the left of Bolsena) was formed about 0.16 million years ago. Post-caldera volcanism produced scoria cones and lava flows (lower left) from vents at or near Latera caldera until subrecent times. The following 66 samples associated with this volcano can be found in the Smithsonian's NMNH Department of Mineral Sciences collections, and may be availble for research (contact the Rock and Ore Collections Manager). Catalog number links will open a window with more information. IRIS seismic stations/networks Incorporated Research Institutions for Seismology (IRIS) Data Services map showing the location of seismic stations from all available networks (permanent or temporary) within a radius of 0.18° (about 20 km at mid-latitudes) from the given location of Vulsini. Users can customize a variety of filters and options in the left panel. Note that if there are no stations are known the map will default to show the entire world with a "No data matched request" error notice. Large Eruptions of Vulsini Information about large Quaternary eruptions (VEI >= 4) is cataloged in the Large Magnitude Explosive Volcanic Eruptions (LaMEVE) database of the Volcano Global Risk Identification and Analysis Project (VOGRIPA).